CES 2012 is not anytime near but we already heard about many companies preparing to make there stall with many new products. And obviously tablet is in the top of the list. Now we heard a huge roar from Coby. Coby has five tablets running Android 4.0 Ice Cream Sandwich for CES 2012. They all share the same 1GHz ARM Cortex A8 CPU. The slabs range between seven and ten inches, and will offer up to 1GB of RAM with up to 32GB of expandable memory -- Wi-Fi radio and HDMI-out come standard. Coby is planning to make them available to consumers within the first quarter. And everyone expects those are cheap than others. Now wait and see. Before seeing keep reading the Press Release Coby has for you now. LAKE SUCCESS, N.Y., Dec. 9, 2011 /PRNewswire/ -- Coby Electronics Corporation, the CE leader with products designed to fit every lifestyle, today announced it will ring in the New Year with the exciting launch of its all-new, highly-anticipated collection of Android™ 4.0 OS – "Ice Cream Sandwich" – Internet tablets. Among the first to market with one of the largest lineups of Ice Cream Sandwich-operated tablets, Coby will debut five standout introductory models, giving consumers a wide variety of unique styles and sizes to choose from – all at incredible prices – starting Q1 2012. 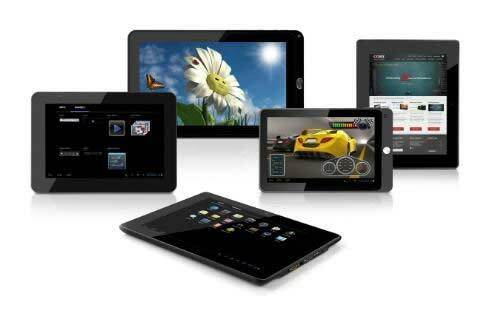 The brand-new Coby Android 4.0 OS tablet collection will be unveiled at the International Consumer Electronics Show, Booth #12027, in the Central Hall of the Las Vegas Convention Center, January 10-13, 2012. "Coby is thrilled to announce our premiere range of feature-packed Android 4.0-powered Internet tablets that will put the world in consumers' hands as never before," said Jodi Sally, Vice President of Marketing, Coby Electronics. "We also are proud to be among the first companies to make available a wide range of the newest, Ice Cream Sandwich-operated units, helping to further underscore our commitment to meeting the demands of a broad base of consumers with innovative products in the hottest CE categories." Following on the success of Coby's current top-selling Internet tablets, the exciting Android 4.0 assortment will include the 7" MID7042, 8" MID8042 (4:3 aspect ratio), 9" MID9042, 9.7" MID9742 (4:3 aspect ratio), and 10" MID1042. With lightning-fast access to thousands of apps and wireless web browsing, the upcoming units all will feature 1GHz ARM Cortex A8 CPU and offer capacitive multi-touch screens, up to 1GB of RAM, expandable memory up to 32GB, Wi-Fi and HDMI 1080p output. Overall, Coby has stream-lined its features to address the core applications including: browsing the web, playing games, email and viewing one's favorite media.